Esther Dawson is a petite, 70-year-old widow who likes to cook and spent years working in home health care and other jobs while she raised her children. 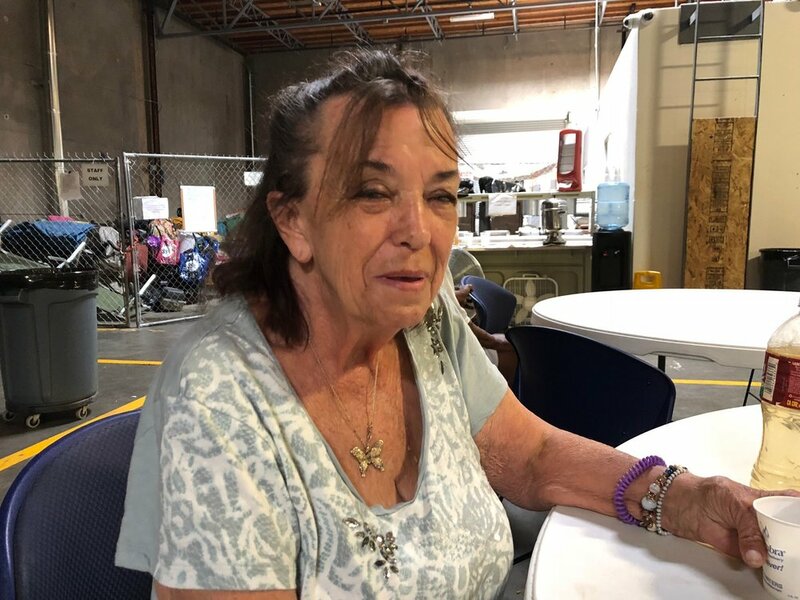 Until last month, she was also homeless, living under a bridge near the American River in what she described as "a little tent city." Now that she's in the City's Triage Shelter, she said, "I'm on my way to becoming a human again." David Patterson is another recent arrival at the Triage Shelter. 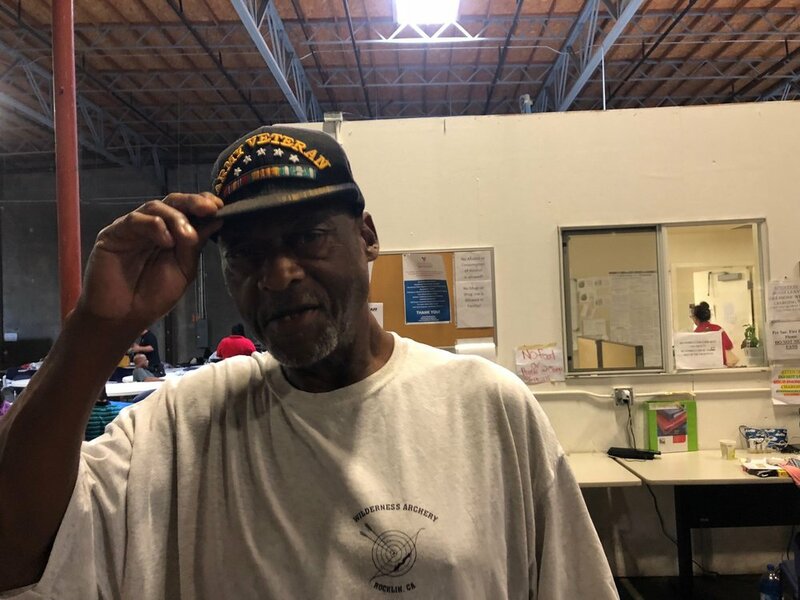 The Vietnam veteran said he became homeless after gout in his joints caused debilitating pain and left him unable to work. He lifted his shirt to display the long scar from triple bypass surgery he had just two months ago. Patterson also has diabetes. After his discharge from the hospital, he said, "I slept in my truck until I heard about this place and came on in." Dawson and Patterson are among the 200 people who currently occupy the Triage Shelter on Railroad Avenue in north Sacramento. The shelter was scheduled to close at the end of August, but Mayor Darrell Steinberg announced on Wednesday, Aug. 8 that he had negotiated an agreement with the private interests who control the property to keep it open until the end of November. Money raised from the private sector will fund the additional 90 days. Mayor Steinberg said the City needs more time to find land appropriate for erecting several sprung shelters that could house 100 to 200 people apiece. "By the end of November we will do everything in our power to open a sprung shelter on another site," he said. "My commitment is absolute. I focus on this daily." The Triage Shelter was originally scheduled to close at the end of May, but the Mayor negotiated a previous extension. Of the current shelter, he said, "We have proven the concept; it's successful. We've gotten hundreds of people who have been homeless for years off the street." Of the approximately 400 people who have come through the Triage Shelter's door since it opened in December, 115 had been placed in permanent housing as of July 18. Some of those who are now housed spent decades living outdoors on the river or the streets. Many suffer from physical ailments, mental illness and addiction. Nearly two thirds of the current residents are 45 years or older; 30 are at least 62. Residents of the Triage Shelter ask staff frequently about whether it's going to close, and when. "It would be a shame if it got shut down, because there are miracles taking place every day here," Dawson said. "People who had no hope have hope." The Triage Shelter represents a new approach that is being embraced by cities across the country as the best way to get large numbers of chronically homeless people off the streets. The idea is to reduce the barriers for people who might be reluctant to come indoors. The Triage Center allows people to bring their pets and possessions, and to bunk next to those who they consider their family members. While drug use is not permitted on site, people aren't turned away because they have addiction issues. Terry Tunstall, 58, was recently placed in permanent housing after living on the American River for 11 years. He came into the shelter shortly after it opened last December with his two dogs, Cocoa and Tasha. Cocoa is blind. Tunstall has a 10th grade education. He said he lost his job at Mather Air Force Base in 1997 and never found another one. "I tried to get back in the workforce; I just never did," Tunstall said. "The older I got, the harder it got." The main source of referrals into the shelter so far has been the Sacramento Police Department's Impact Team, which identifies vulnerable homeless people and finds them on the street. Every Tuesday morning, the Impact Team hosts a meeting where people from various entities working to reach out to the homeless view a Power Point presentation on the status of each person they are trying to help. The last few slides feature success stories of people who have been successfully placed in permanent housing. "It's nice to see," said Officer Kyle Roberts. The other main source of referrals into the shelter is the City's new Pathways program, also known as Whole Person Care, which identifies homeless people with significant health issues and provides them with wrap-around services, including health care, mental health services, housing and obtaining crucial documents like Social Security cards and driver's licenses. Tunstall is a Pathways enrollee. His case worker helped him obtain his Social Security benefits, which have allowed him to get housing. Other people in the shelter who qualify for Whole Person Care are enrolled in Pathways after they arrive. Whole Person Care is a four-year pilot program funded by federal Medicaid dollars matched by local funds. The City of Sacramento was accepted into the program in June 2017 with a budget of $64 million. The city’s $32 million match for $32 million in federal funding was mostly provided by major health care systems in the city, including Sutter Health , Dignity, UC Davis and Kaiser Permanente. The city itself contributed $2 million. Pathways targets people with mental, addiction or physical health issues that have landed them in the hospital or in the emergency room multiple times, or caused them to have multiple encounters with the police Impact Team. A non-profit called Sacramento Covered enrolls patients, coordinates their care and maintains their centralized records. Clinical services are provided by four inter-disciplinary teams run by Elica Health Centers, Sacramento Native American Health Center and Wellspace Health Inc.
More than 500 people have enrolled in Pathways since its launch on Nov. 1, 2017. More than a quarter of them have been housed. Jodi Nerell, Director of Behavioral Health Integration for Sacramento Covered, said the Triage Shelter is a crucial component of Pathways' effort to get people stabilized and ultimately place them in permanent housing. "To have outreach workers out there with no access to any kind of shelter would handcuff them," Nerell said. "It makes it really difficult if you don't have a place to refer folks into. "Having a low-barrier shelter has definitely attracted the people we're trying to serve."